Scan Copyright © The Pie Shops Collection (pieshops@gmail.com Jordan Smith). All rights reserved. Although the googie-style sign has been replaced by something more plain, the Beverly Crest is still there on what used to be the main routing of U.S. Route 54 through El Paso. 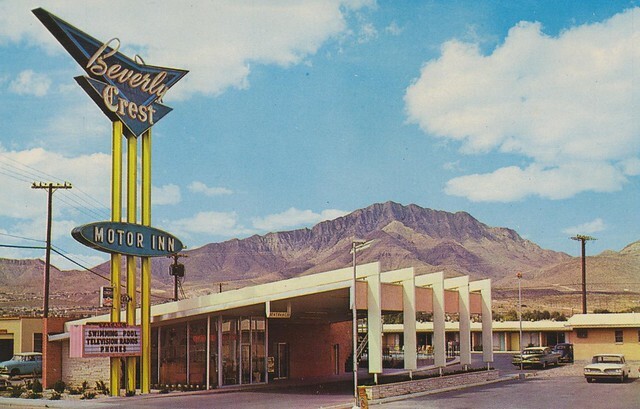 However, judging by the few reviews I read when researching this postcard, unlike many of the other still-existing mom-and-pop motels from America’s glory days that have been posted here, I don’t think I would recommend staying at this one. Posted in Date Unknown, Retro/Vintage, TravelTagged Americana, architecture, motel, mountainBookmark the permalink.